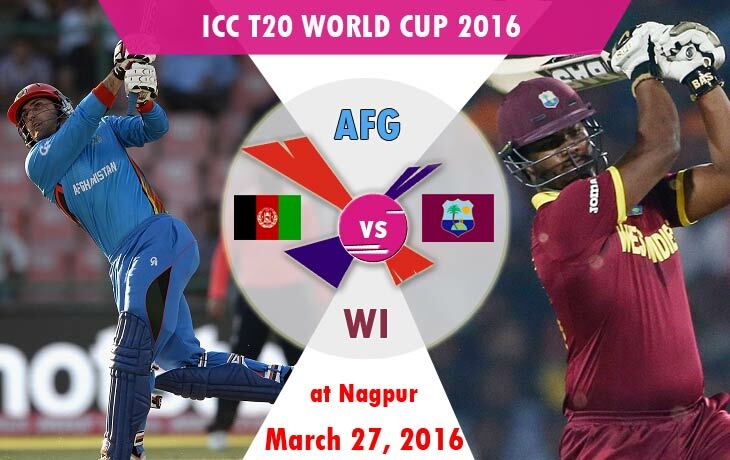 Looking for Afghanistan vs West Indies T20 World Cup Live Score Updates and learn how to watch Live Streaming Online? In front of the global audiance, the most trendy team West Indies going to face the last table Afghanistan at Vidarbha Cricket Association Stadium, Jamtha, Nagpur, India in 15:00 Indian Standard Time. Afghanistan pushed back on their last three Super 10 matches of this tournaments against with South Africa, England and Srilanka. The team, Afghanistan tried to get at-least an half bag of the tournament but they can’t able to do that. Even today’s match (March 27) also they face one of the BIG opponent in the Group 1, West Indies. In the 24th Match of ICC T20 World Cup 2016, England faced the Afghanistan with winning toss and finally the team also won the match. Even, Afghanistan player Rashid Khan bowled on his own style as Legbreak googly well with the two wickets and stopped the run rate with the economy rate of 4.25. Also, there is one more player who maintain their economy rate as same 4.25 with the sane two wickets, he was Mohammad Nabi. Only thing, the team forgot to chase the England’s score 142 runs. On lower batsman, Shafiqullah scored 35 rums in 20 with two sixes at the last situation of the innings. One of leading test cricket team South Africa failed to win the match against with West Indies on 27th Match of ICC T20 World Cup 2016. As a same comment from as that we noted, the team West Indies won the toss and the match also. Russell, Gayle and Bravo are all picked two wickets each of them. The opponent, Rabada took only one wicket, that too Gayle‘s stump. The Opener Charles and Samuels scored 32 and 43 runs as highest scorer of the innings. Even West Indies struggled to score 123 runs within 20 overs.